So, you wanna see what a trike looks like up close? Well come on in and and we'll even let you ride one. Otherwise, you can look at this page at some of the pictures we've posted. Do you have a cool picture of your trike? Send it in and we'll post it for you. After a great parade ride down Center and Main Street here in Spanish Fork, the Utah Trikes crew decided to stop by Sonic for some 99 cent root beer floats. It was fun watching the reactions when we pulled up showing just how cool our rides are. Doin' a Stoppie on a Trike. 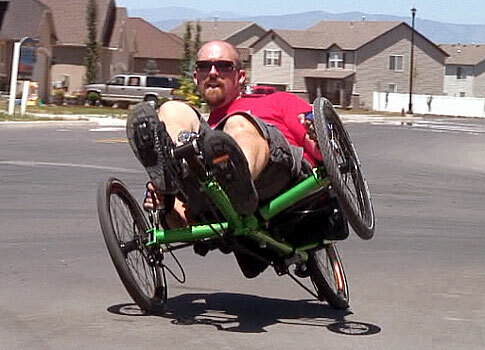 While riding the TerraTrike Cruiser in the Fiesta Days parade here in Spanish Fork, Brent decided to show off his favorite trick; The Stoppie. The crowds seemed to really enjoy this fun little stunt. WizWheelz Wheelie on the Race! Sure, a TerraTrike is a wonderfully comfortable and practical trike. But, it's also incredibly fun. We love extreme triking and doing tricks. This is Ashley showing off his front end wheelie. Very cool.